The much-venerated goddess Ushnishasitatapatra manifests her great power with a thousand faces, a thousand arms, and a thousand legs. Each of her faces has three eyes; the palm of each hand and sole of each foot has its own eye. She holds a large parasol, attribute of Avalokitesvara, the bodhisattva of compassion, along with numerous arrows, dharmachakra (wheel of the Buddhist Law) and double vajra (thunderbolt scepter). She stands against a flaming aureole in a verdant landscape, with three fierce protector deities in the foreground. Beneath her feet are all the evil-doers, which she keeps under firm control. Three sages seated in green clouds at the top of the painting signify the three orders of Tibetan Buddhism: Padmasambhava, at left, represents the Nyingma; Tsong Khapa, center, represents the Gelukpa; and the Great Adept Marpa represents the Kagyu. The Qing dynasty emperors were great patrons and practitioners of Tibetan Buddhism. This painting bears close similarities in style to paintings produced for the Yonghegong, the palace in Beijing that emperor Qianlong (reigned 1736–1795) converted into a monastery for Tibetan monks residing in the Chinese capital. 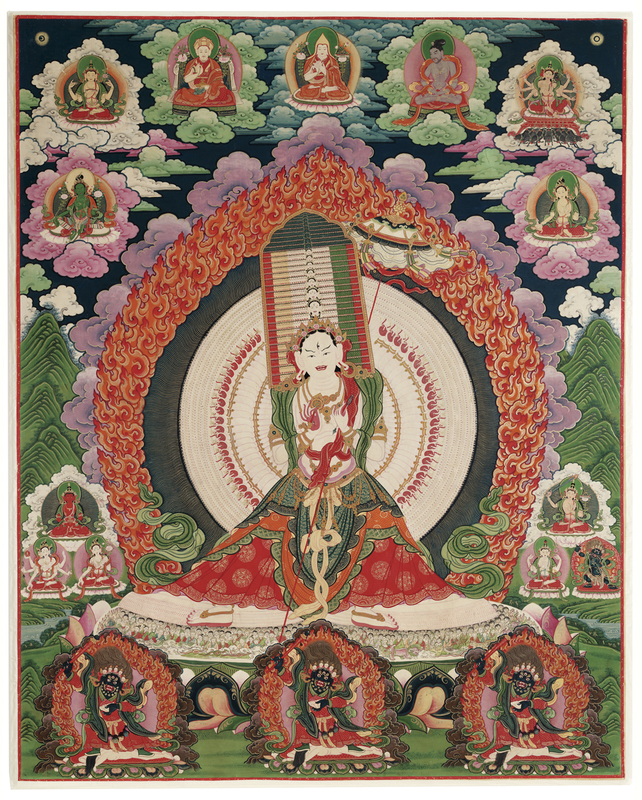 Many years before the Johnson acquired this thangka in 2002, a previous owner had removed the painting from its original brocade mountings and adhered it to Masonite. Its acidity posed a serious threat, so the Museum consulted conservator Tatyana Petukhova LaVine for a condition assessment and proposal to remove the backing. In 2008, the painting's conservation treatment was successfully completed using a new technique developed by LaVine in response to the special challenges of this painting. Read more about her pioneering work here.